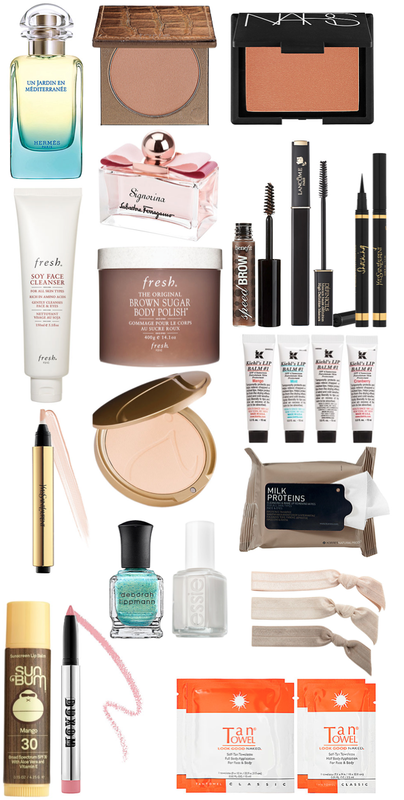 I've received several emails about my makeup and skincare routine and I'd thought I would share some of my favorite products. I also use drugstore products- like this mascara and this cream shadow. I keep my skincare routine very simple using this cleanser and other natural products. As for makeup, I wear this foundation and bronzer. But, I've starting using this blush and lip color. For my eyes, I love Lancome mascara. When I do wear eyeliner, I reach for YSL. I take my makeup off with these wipes. As for fragrance- I go for this and this depending on the seasons. On my nails, I usually wear Marshmallow by Essie. I just bought Deborah Lippmann polish and cannot wait to wear it in St.Barts. Tan Towels are great for travel and Fresh scrub makes your skin baby soft. I would love to know what your favorite beauty products are- please share! I love all of these products! I especially love the creaseless hair ties. Those things are my absolute favorite for keeping my hair out of my way in a cute and stylish way!